LIVONIA, MI (October 15, 2015) – While most are bringing out their orange and black this month, the Michigan Hawks and St. Louis Scott Gallagher – Missouri (SLSG-MO) teams were sporting pink last weekend as the teams kicked off at Jaycee Park in Livonia, Michigan. October is National Breast Cancer Awareness Month, and Doug Landefeld, the ECNL Director for the Michigan Hawks, has always wanted the club to be a part of this cause in some way. This year he contacted Adidas, and they agreed to provide pink uniforms for the team so that they could show their support on the field and continue to share knowledge about a disease that affects so many. Landefeld reached out to Ralph Richards, the ECNL Director for SLSG-MO to inform him about the team’s intention to wear pink uniforms in their upcoming match. Richards immediately wanted his ECNL teams to get involved as well, and to help educate others about National Breast Cancer Awareness Month. “It’s such an important issue today, particularly in an all female league, where so many young females have dealt with this disease in some way. We jumped at the opportunity to assist in the cause.” said Richards when discussing how SLSG-MO joined the Hawks’ efforts during Breast Cancer Awareness Month. The SLSG-MO players wore pink headbands and pre-wrap in the hair, and Richards purchased pink socks for all of the players to wear with their white uniforms. It is estimated that and average of 1 in 8 (12%) women in the United States will develop invasive breast cancer during their lifetime, according to the American Cancer Society. It is all too common to know someone who has been affected, and it is one of the reasons Richards was so eager to have the club join the cause. A mother of an SLSG-MO player is currently battling breast cancer. The team has seen this disease impact her family, as with many other families, and Richards and the rest of the club wanted to do their part and show their support. Both ECNL Member Clubs wish to continue wearing pink for the duration of October to support Breast Cancer Awareness Month, with the hopes of encouraging other member clubs in the Midwest Conference to join in on the action. “Hopefully this is not just a one month effort, we want to continue to be at the forefront of breast cancer awareness,” said Richards. The ECNL is honored to have two member clubs be a part of National Breast Cancer Awareness Month. 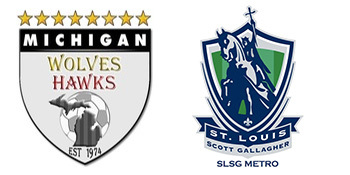 The Michigan Hawks and SLSG-MO are examples of how the ECNL strives to enhance the developmental experience of players both as athletes and as young women.